This year the event will be, most likely, the biggest ever. With 13 categories, the end-of-week will be marked by numerous races, in which the public can see and review all of the Automobile decades, since the early 30's to the 80's. The event already has more than 280 confirmed teams, with an expected total of more than 450 cars and over 500 drivers. The Lola "Team BIP" the car that was part of the first Portuguese team in international competitions and is known to all lovers of endurance racing. It is clearly a car that was in the minds of everyone, especially for the few who saw him compete in Vila Real and Estoril, getting great results. Also the Ferrari 250GT Breadvan will be the headliner. This unique model, designed by Giotto Bizzarrini and Piero Drogo, participated in the 24 Hours of Le Mans 1962 and is one of the most precious Ferrari ever made. A true work of art, its history, beauty and technical development. Thanks to its Austrian owner, you can not only see the car in a museum, but also hear this precious model on a runway at the Algarve International Circuit. The third will be the Cooper T51 Formula 1 model that competed between 1959 and 1961 and who gave Cooper the World title in the first year of competition. In Portugal this model is especially remembered for the victory of Stirling Moss in Monsanto Circuit in August of that year, and the stakes of "Nicha" Cabral behind the wheel of this model, with Maserati engine. 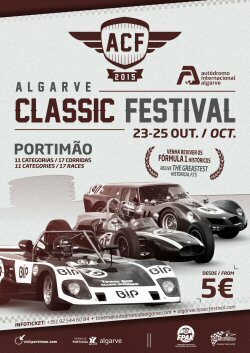 These are only some of the highlights confirmed for this year, which also include models like Ford GT40, BMW M1, Jaguar D-Type, AC Cobra, Alfa Romeo Giulia GTA, among many others, that can be known in www.algarveclassicfestival.com. A little over a month, Interncaional Karting Algarve prepares to receive the Rotax MAX Challenge Grand Finals. The event, which will take place 8-14 November brings together the best riders from around the world competing in the trophy given to the Austrians engines. For the second time in Portimao, this competition has the participation of 288 world's best kart racers will compete in four categories, making it the world's race in terms of nationalities in dispute. Among the many pilots will be Rubens Barrichello, the former F1 driver, who at 43 won the Rotax Max Challenge DD2 category in the South American and so secured the place in the final in Karting International Algarve. The rider with the highest number of shares in F1 GPs, won for the second time in his career a South American title kart.